The Festsaal makes noise in the heart of Kreuzberg, one of Berlin’s trendy neighborhood and alternative counterculture district. It’s a really nice club, with a balcony around, good atmosphere and hosting approx. 500 people. I’d say more than 200 fans attended tonight’s event, although around a third probably was always outside in the club’s own beer garden. Well, it was a mild evening… The SO36 club is around the corner, the C-Club not far away… generally it’s such a lively and sizzling area, crazy. Nobody’s sleeping over the weekend I bet *laughs* I remember last year’s Friction Fest, another district but same ecstatic, wild and crazy atmosphere. Love it! Maybe I should relocate? Afterwards :: RORCAL :: not only shook the foundation of this club, with all (musical) means they generally drag and wrench on all aspects of human existence. Illuminated by four candles and 2 stroboscopes RORCAL close in with ultra brutal sounds, celebrating creepiness between Doom, Core and Drone, opening deepest and blackest abysses of mankind. I thought it cannot go any darker and more brutal… later this evening I was taught a lesson. As for now, and just for your private apocalypse, suffering and tormented souls might pick the band’s fifth record, a 70 minutes running one-song-monolith entitled Heliogabalus. Warmly recommended. As for me, another haunting discovery. First thing that catches my eyes is that GORILLA MONSOONs singer Jack Sabbath lost his hair, except for a little 0.5 mm and thus hardly visible stripe in the middle. And there is a new guitarist named K.K., replacing Phil, who left in February. I was hoping for a new song and got one, a yet untitled one. But I’m not sure, better said I can’t remember anymore, if it was the one I already got to hear during last year’s tour with Disbelief. However, they did not play Extermination Hammer, did they ever? *grrr* And generally speaking this set was way too short! No merch either. Nevertheless, if you know GORILLA MONSOON, you know what you get live on stage: an asskicking, pure rock’n’roll exuding hell of a show! That one-of-a-kind show you won’t forget. Just amazing. Time passes by and with the running order already announcing the end of the festival headliner :: DIRGE :: just get upon stage. I love their music; love their records and they are the main reason to attend this festival at all. They had a little tour prior the festival and just played in Germany for the very first time. Equipment was completely changed, that took even more time since DIRGE have a lot stuff to connect. The projector, unplugged by Celeste before, does not work properly anymore, so visualizations fail. DIRGE have just released a brand new album entitled Elysian Magnetic Fields they presented live, playing 5 of its 8 songs. Hey, that means DIRGE just played for 45 minutes! As a headliner show??? Way too short. Of course! Generally I have to say also live DIRGE bear a striking similarity to Neurosis. Just extended by the so often quoted certain je ne sais quoi especially French bands own. Yes, it was an outstanding show, at least for me, but same here: I have to see them again! Ok, let’s see what the organizers will reveal for this year’s DOOM OVER LEIPZIG edition. 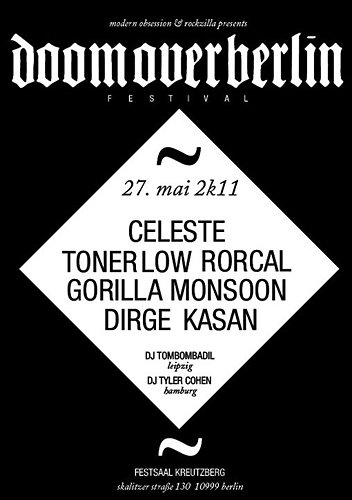 And… it looks like there will be another DOOM OVER BERLIN festival next year :) Yes, please do so! Oh, and what about a DOOM OVER Muenster, Bochum, Essen, Cologne… etc. version??? I WANT!